The aroma of coffee beans in the morning can be a powerful source of mindfulness, says an expert from Aroma Bravo Coffee and Tea. CARSON CITY, Nev. - June 6, 2017 - PRLog -- Mindfulness has long been known to provide multiple health benefits, including reduced stress levels, lower blood pressure, and improved creativity. This activity is a form of meditation that has been practiced for centuries, and many people continue to be drawn to it because of its simplicity. Almost any situation can be a good opportunity to meditate—even the simple act of smelling coffee aroma in the morning can be enough to relax the brain and induce mindfulness. "There is currently a revival of meditation especially among the millennials," says an expert from Aroma Bravo Coffee and Tea. "A good number of young adults seem to be particularly interested in the benefits of mindfulness. Some of them even practice it while having their morning coffee." Since caffeine is considered a stimulant, the combination of coffee and mindfulness may seem like a mismatch at first. However, there is actually some scientific reason behind it. Studies have shown that the aroma of gourmet coffee beans have calming effects on the brain which help reduce stress and keep the mind active. "A warm cup of coffee is a simple yet very effective way to induce mindfulness. If you focus enough, it can really put you at ease and make you live in the present," the Aroma Bravo expert remarked. To begin the practice, he advised meditators to concentrate on the different sensations coming from the coffee cup. "Pay close attention to the warmth and the inviting aroma of the coffee. Take the time to smell and appreciate what's in your hands. As you take the first sip, note the delightful flavors that are now in your mouth and swallow it with sincere gratitude. Drink the rest of your coffee slowly with your mind focused entirely on the present moment, savoring every taste and every flavor. Do this every day as you have your morning coffee and it will have a positive effect on your mood for the day," the expert further added. 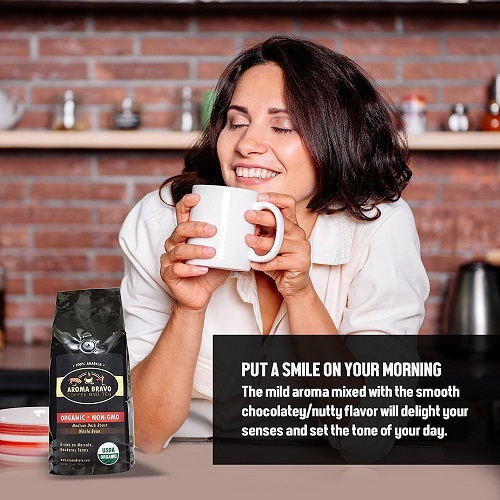 More information about the benefits of coffee aroma is available at https://www.amazon.com/dp/B01N6LFV0R. Aroma Bravo offers Arabica gourmet coffee beans from Honduras. Roasted in small batches by master roasters, Aroma Bravo Coffee is a must-have for gourmet coffee lovers.